Dubai, UAE, April 16, 2018: Calling all adrenaline junkies! 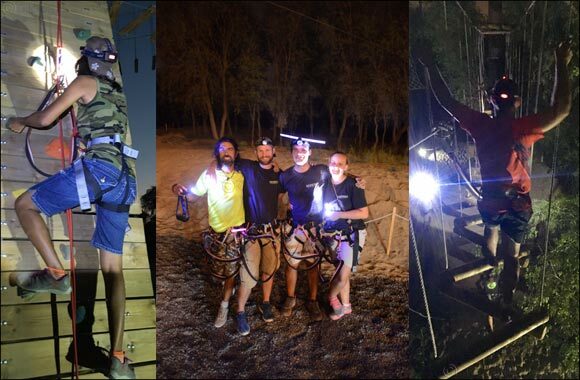 If you have already experienced the action-packed Aventura Park during the day, why not make the most of the cooler nights and enjoy an exhilarating zip-line in the Ghaf tree-lined forest in Mushrif Park after dark? At Aventura Parks, you can test your mental and physical agility whilst having fun in the great outdoors. Dubai's first adventure park offers an unforgettable experience filled with thrilling zip lines and over 80 climbing, tree-surfing, zip-lining, rope-crossing challenges spread over 5 different levels, off the ground and in-between the trees. By night, the excitement is taken to new heights as you experience the park from a new perspective, taking on zip lining challenges in the carefully illuminated park, under the starry night sky. Sport, adventure and fun is guaranteed for all ages at Aventura where safety is a top priority. From Sunday 15th April Aventura Parks will be open from 10:00am to 7:30pm during weekdays and from 9:00am to 10:00pm from Thursday to Sunday. Your escape from the hustle and bustle of the city is located just 15 minutes away in the beautiful green surroundings of Mushrif Park. Grab your friends and unleash your inner Tarzan as you glide through the trees on zip-wires and cross the high-rope obstacles in the dark – a truly unforgettable night out in the great outdoors awaits. Next Story : 10th Emirates Airline Festival of Literature Ends with a Bang!